The Denver 100 provides this Annual Real Estate Report as a service to our clientele and friends to give the current trends in the Denver residential real estate market and a resource to predict the future housing direction in our marketplace. 51,848 single family and condominiums sold in 2018 compared to 54,736 that sold in 2017 or a 3% decrease in the number of homes closed. At Year End 2018 there were 5,254 active homes for sale compared to the beginning of 2018 which had 3,444 an increase of 6% in inventory over last year this time. This increase should not suggest a market correction or crash. The reason is the inventory was so low that increase by 53% is bringing the market to more normal conditions. The average price of a home in the Denver Metro Area ending 2018 is $463,946 compared to $428,489 ending 2017 year, which is an 8.3% increase in price for the mix of properties sold. By comparison, 2006 had a single family average price in Denver of $317,112. The average days on the market for 2018 is 25 compared to 24 one year ago. The selling price obtained compared to List price is 99%. What this means is that buyers were willing to pay full price or more to buy a home in 2018, but this figure most certainly lowered as the year went by and most of that gain was early in 2018. The absorption rate for single family homes in the Denver Metro Area with 2018 year-end inventories is 1.32 months. As the inventory increases so does the absorption rate. This inventory month supply will rise during the spring and summer seasons. The $250,000 to $500,000 price range had the most detached home sales with 23,607 homes closed in 2018 creating an absorption rate of 25 days of inventory. Below 6 months of inventory typically indicates prices will continue to increase. Conversely the $1 million and above price range had a total of 1833 homes closed in 2018, creating a current absorption rate of 39 months of supply. This is an increase in supply from 12 months ago, and moving in the direction to have luxury properties start to flatten out in price. Sellers continue to be in the drivers’ seat in the sale negotiations of homes especially priced below $500,000. However, the bidding wars are slowing and in most parts of Denver are now not happening. Sellers’ need to be aware of this shift in the market and not get too aggressive in price, terms or a lack of move in condition in your home. The briskness of sales and the number of buyers buying started to slow down in 2018 and a more normal trend of homes taking a little time to sell is now happening vs. the last 3 years. The inventory continues to remain at lower levels even though expectation of higher inventories are on the horizon, we are still at record level low inventory. The buyer behavior is that the buyers are not as willing to jump into the bidding war process and are taking a little longer to buy. This will elongate market periods for sellers. The increase in home prices across the metro area for 2018 has helped people feel a little wealthier as more homes have more equity than they have had over the last 10 years. 2018 sold data for the 8 county Denver Metro Area reflects 38,179 single family homes closed this year compared to 41,071 homes in 2017. 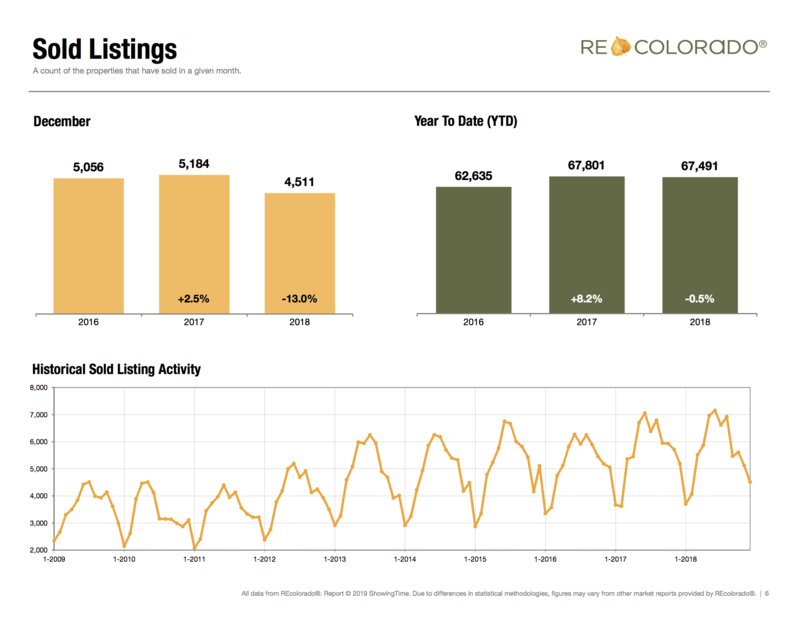 This 7% decrease indicates sales for the Denver Metro area are stabilizing and does indicate a more conservative growth moving forward into 2019. The number of attached units closed data for 2018 is 15,663 This is a 5% decrease over 2017 which recorded closed units of 16,637. Clearly this decrease in attached unit sales suggests that the mix of inventory and the buyers willingness to pay top dollar for condos/townhomes is changing. For first time buyers, condos/townhomes will be the alternative choice as there are few single family homes priced below $300,000 in the Denver market. The number of sold properties in Denver for 2018 priced below $500,000 is 37,725. Homes priced below $500,000 make up 73% of all the sales in Denver. All Properties priced above $500,000 that sold in 2018 is 14,123 homes/condo’s compared to 2017 which had homes/condo’s sold of 14,101, or a Small increase in sales of this price This indicates that the upper price range market remained strong in 2018. Attached Home sales in 2018 recorded 15,663 units sold. Most of the sales of condos were under $500,000 making up 86% of all the condo’s sold. Average Price is the another star in the Denver real estate market hat in 2018 marking the strongest equity position in Denver’s real estate market. Price rises when days on the market shortens because buyers are making a more aggressive buying position. The Days on the market in 2017 was 24 days for a home and today it is 25 Days or virtually no change in Days on the Market. However, we have notice in the 4th quarter of 2018 that the days on the market increased to 39 days, indicating buyers are taking longer to make a buyer decision and the trend most certainly is elongating the days on the market. The number of available properties to buy will continue to rise over 2018 levels on a gradual basis through the spring and summer. As the market normalizes with higher supplies of homes, appreciation of home prices will slow down, plus the time to market the home to a contract will elongate to 40-60 days vs. 25 days. Today’s home Prices have more than offset the negative adjustments made during the 2008 to 2012 years. There are a sufficient number of homes with substantial equity that can take advantage of refinancing to remove some of that equity that has been gained over the last 5 years. This refinance phenomena does bring sellers to the market to sell and those sellers may consider selling now due to the fact they have a chance to get out with a large equity position. Unemployment for 2019 is going to continue to be lower than the national average as we anticipate unemployment to be in the high 3% to 4% range for the upcoming year which brings some additional buyers to the buyer pool, creating a situation for sellers to continue capture the Right Buyer for their home. Sales will decrease slightly for 2019 with total closed sales to be approximately 50,000 single family and condos sold for the upcoming year. The first half of 2018 experienced an abnormal amount of buyers entering the market due to low interest rates, stability in their personal economic situation and housing prices that were rising and the buyers didn’t want to miss their opportunities. As the inventory of single family and condo homes closed in 2018 decreased year over year, 2019 will be 2-3% less in number of units closed, which would still make 2019 one of the highest number of sales in a decade. Interest rates will be higher than today and we predict 4.75% to 5.5%. Secondly, the easing of the borrowing guidelines still requires such rigid proof of ability to buy that self-employed or newly employed workers do not meet most of the guidelines causing the buyer pool to retreat some in 2016. The inventory of properties continues to grow to more normal levels, causing buyers to have more choices. The more choices, the less likely the buyers are to “rush” to a purchase. These three reasons are the “why” of the number of units predicted to close to be less than 2018. Prices of homes below $500,000 will increase approximately 3% in 2019 depending upon the location. We do not see any prices of homes below $500,000 reducing in 2019 unless a major job loss occurred in one area, like the airport causing the housing in that particular sub area was affected by an economic occurrence. Prices above $500,000 had a good year in 2018. We see the number of units sold in 2019 to remain constant with 2018 up to $1.4M depending upon the geographic location of a home. Location will always dictate the pricing of homes For example, a $750,000 home in Cherry Creek is liable to go up and sell at a faster rate than the same $750,000 in suburbs of Douglas County. Why would this be? It goes back to the comfort level of the buyer pool who will pay more for location than worry about value. With interest rates, even for jumbo loans at low levels, some buyers who have economic stability in their life can see a bargain even at higher prices due to location. Hence housing in Denver moves faster than Castle Rock due to location and newer styles of homes. The Luxury Market is stable and in the new luxury home market, the product price is increasing faster than the resale homes. Buyer behavior has changed as to what the buyers utilize in a luxury home and the buyers are more interested in convenience than mega mansion size. This has been proven in 2018 as new product luxury sold data is at record prices, while resale homes have sold at approximately 70% of new product sales across the suburban markets. The spread in price between the two types of product is significant and luxury buyers, looking at suburban sub areas will find very reasonable price points in the resale market compared to newly built homes. The First Time Home Buyer Pool will increase in 2019 and make up 35% of the entire market for Denver, as Millenniums find stability in jobs, relationships and reduce personal debt, they will be the purchasers of homes in 2019. This will mean about 17,000 sold units will be to first time buyers. What will they buy? Attached homes will be the first choice for this group, as the prices are more attractive than the entry level detached or single family home. Multi-Family buyer pools are emerging in Denver. This buyer group has proven successful in buying homes in other U.S. cities and is now a target group that is emerging within our communities of the suburbs of Denver. This group is made up of grandparents, parents and children buying together. When you have a downsizing “Baby Boomer” population that has equity in their home and wealth in portfolios, that want a more mobile lifestyle added to a growing buyer pool of Gen X to Millennials population that have working income but no equity, this combination fits a select group of today’s population. Homes offering multiple housing options within a singular property, such as homes with lower level full living spaces, i.e. second kitchens etc. will be attractive to this group. Thank you for allowing The Denver 100 to be your resource for The Denver Housing Market. We are grateful for the opportunity to serve your real estate needs in 2019.